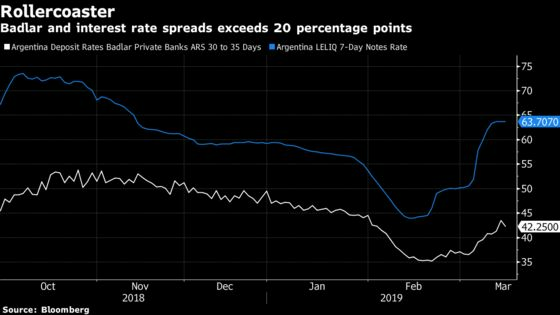 (Bloomberg) -- With inflation rising for two consecutive months, Argentina’s central bank asked the country’s private banks to improve the rates paid to depositors, according to four people with direct knowledge of the subject. The central bank informally talked to representatives of the institutions operating in Argentina, according to the people. The request, which seeks to anchor the financial system and contain consumption ahead of a presidential election, was the focus of a meeting held on March 14, according to three of the people, who asked not to be named because the information is not public. The central bank press office declined to comment. Representatives at the Asociacion de Bancos de la Argentina (ABA) and the Asociacion de Bancos Argentinos (Adeba) declined to comment on the meetings. The central bank seeks to reduce the differential of more than 20 percentage points between the 7-day Leliq rate, which is at around 64 percent, and the yield paid by 30-day savings accounts holding more than 1 million pesos (Badlar rate, which is at 42.25 percent today). The spread is somewhat lower if the deposits hold more than 20 million pesos, which on average receive 45.25 percent, according to a central bank survey. The talks took place after the country’s inflation rose to an annualized pace of 51 percent in February, exceeding analyst expectations. The rise in inflation put pressure on the exchange rate, motivating the central bank to reduce the currency in circulation and increase its interest rate by 17.86 percentage points in the last month. Banks have thus far not adjusted the returns they pay savings accounts by the same degree. “The central bank is worried about narrowing the spread” between rates, said Diego Chameides, strategist at Banco de Galicia and Buenos Aires SA, who did not participate in the central bank meetings. “A smaller gap would allow monetary policy to be transmitted with less effort." Banks see no reason to raise deposit rates while demand for loans is falling in real terms amid a slowdown in the economy. In addition, the difference in length of terms between Leliq and savings accounts generates uncertainty when it comes to setting yields amid a very volatile monetary policy rate. The banking sector’s reserve about following the increase in Leliq led central bank officials to evaluate alternatives that encourage banks to implement changes. The central bank is considering at least three measures to help close the gap between passive and active rates, according to the people. One option is to extend the Leliq maturity to bring it closer to that of time deposits, while another is to allow banks to invest more of their reserves in these bonds. As of now, banks have to set aside 18 percent of a certificate of deposit as part of reserve requirements. A third option is to lower the level of these liquidity requirements to reduce intermediary costs. The central bank is analyzing the possible implementation of one of these measures, the people said. “There is no demand for credit and not all banks want to grow deposits to buy up Leliq, even less so if they won’t earn any spread,” Juan Jose Ciro, financial director at CMF Bank, said. While Chameides acknowledges that the lag between rates is important, he sees the rate spread falling over time.